If you are looking for a useful guide before purchasing a drill bit set, this article is for you. Twist drill bit, wood spade drill bit, etc. 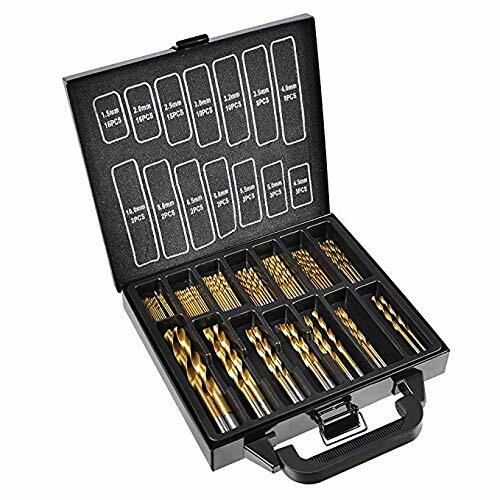 Everyone is looking for a drill bit set that could possibly handle many tasks without having to buy every single bit for a particular project. When choosing the best drill bit, you have to take a look at the variations of the drill bits and the materials you could use them on. How about considering titanium coated drill bits?Titanium, which is stronger than steel, is a lightweight and silver-colored metal. It can combat corrosion and sometimes changes in color when exposed to excessive heating. It can be mixed with other elements such as iron and aluminum to create stronger alloys used in many industries. Compared to cobalt steel, a titanium coated HSS tool is far more durable and this is exactly one of the properties of this element. Titanium drill bits are designed for drilling hard materials including metals, steel, hardwood, and concrete. 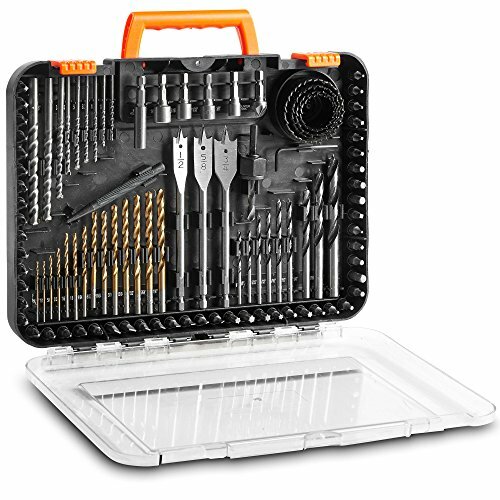 This VonHaus 100pc Drill Bit Set is a comprehensive toolbox for metal, masonry, and woodwork. The added chrome vanadium steel also contributes to clean, precise, and maximum drillings. The vanadium steel drill bits have center points to prevent drills from walking across the workpiece. It is essential to have this practical toolkit. The VanHaus drill bits are safely placed in a storage with molded placeholders and recognizable labeling to easily access the tools you need. The color-coded set makes the items distinctive and the clear cover makes viewing easy. The case has an ergonomic design for storing and traveling. Hole saws are not for metals, they are for wood only. Drill Bit Type: Twist drill bit, wood spade drill bit, etc. Shank Type: Round, hex, etc. 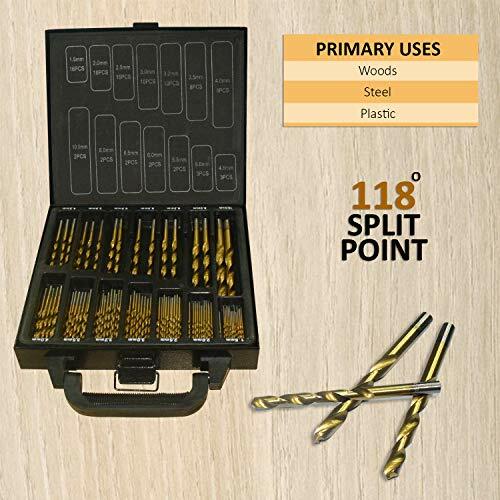 This all-in-one kit contains 14 titanium plated HSS twist drill bits measuring 1/16" (2 pieces), 5/64", 3/32", 7/64", 1/8", 9/64", 5/32", 11/64", 3/16", 13/64", 7/32", 15/64" and 1/4". For woodwork, there 9 wood drill bits which measure 1/8" (2 pieces), 5/32"( 2 pieces), 3/16" (2 pieces), 1/4", 5/16" and 3/8". There are 3 wood flat drill bits that measure 1/2", 5/8" and 3/4". The cupped nail punch is very useful for knocking gimps on wood. If you want to make a hole in your workpiece without cutting the core, you can use any of the 4 hole saws measuring 1-1/4", 1-1/2", 1-3/4" and 2-1/8". The hole saws come with a detachable arbor adaptor. There are 4 nut drivers for fastening nuts and bolts which measure 1/4", 5/16", 11/32" and 3/8". To drive screws with hexagonal sockets, you can use the hex key. The countersink drill bit can cut conical holes and allows a flathead screw to sink in the material you drilled it. You could also have the magnetic bit holder which holds the bits in place when drilling holes. For masonry jobs, do not underestimate VonHaus Drill Bit set. There are 9 masonry drill bits measuring 1/8" (2 pieces), 5/32" (2 pieces), 3/16" (2 pieces), 1/4", 5/16" and 3/8". These masonry drill bits are used for stone, block, concrete and other tough materials. There is a set of 52 vanadium steel screwdriver bits divided into 7 categories; 8 slotted or flathead screwdrivers measuring 1/8" (2 pieces), 5/32" (2 pieces), 3/16" (2 pieces), and 1/4" (2 pieces); 10 Phillips screwdrivers in #0, #1(3 pieces), #2(4 pieces), and #3(2 pieces) sizes; 10 Pozi screwdrivers in #0, #1(3 pieces), #2(4 pieces) and #3(2 pieces); 8 star screwdrivers (T10, T15, T20, T25, T27, T30, T35 and T40); 5 Inch Hex (T10, T15, T20, T25, T27, T30, T35 and T40); 5 Metric Hex (H2, H3, H4, H5 and H6); and 6 Square screwdrivers (#0, #1, #2x3 and #3). Inside this portable and organized case are 100 drill and driver bits for your all-around jobs. I am giving you a quick list to summarize VonHaus 100pc Drill Bit Set. Now, you are all set for your repair and maintenance projects. You already know what’s inside this toolkit but it is also important to know the kind of materials the tools are made of. Have you heard of HSS? Well, if you are a beginner or a professional in the construction industry, this word is one of the terms you have to be familiar with. HSS stands for High Speed, which means these steel drill bits are made from carbon steel. It means they are designed to be used at high-speed drillings. They can drill on materials such as iron, steel, brass, copper, and aluminum alloy. 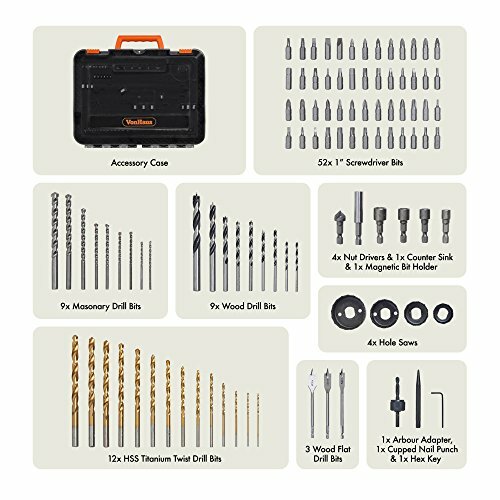 VonHaus 100pc Drill Bit Set is a complete toolkit for metal, steel, wood, masonry, and plastic. Making holes successfully is always been a challenge while concerning the sizes. I was looking for a drill bit set with a variety of choices when it comes to sizes. Then I found Neiko 10193A Titanium High-Speed Step Drill 3-Piece Bit Set with 28 sizes. The combined sizes are really amazing. Just imagine having 28 size choices in just three drill bits. It absolutely saves space and trouble. These 3 drill bits have a total of 28 different bit sizes. Each increment is about 3/16 with the exception of the tip which is around 1/4 inch. Now, let’s talk about durability. 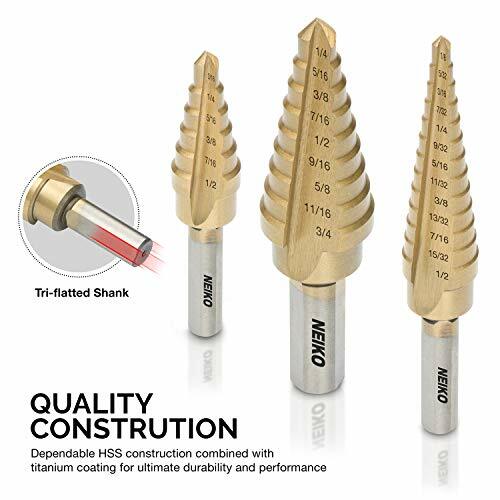 Neiko 10193A Titanium High-Speed Step Drill 3-Piece Bit Set is made from a classic high-speed steel plus the titanium coating which makes the drill bits sturdy in drilling holes in various materials such as plastic, aluminum, copper, stainless, and metal sheets. You could also find these titanium step drill bits useful when making holes in automotive parts. You could successfully drill holes from plastic to metal sheets on your vehicle with no issues at all. The bits are really sharp and can cut clean holes. Another surprising use is being able to cut on a porcelain-coated material. The result is no chipping. The bits are very careful with the next bigger cut so they eliminate breakout around the hole. The 135-degree splint point adds to the ease of cutting with self-centering and prevents walking. Meanwhile, the two-flute design clears chips faster and allows particles to escape easily. The tri-flatted shank perfectly holds and fits power tools chuck securely and eliminates slipping. Bit #1 has 6 steps, and the sizes available are 3/16, 1/4, 5/16, 3/8, 7/16, and ½ inches. Bit #2 has the most number of steps which is 13 and the sizes are 1/8, 5/32, 3/16, 7/32, 1/4, 9/32, 5/16, 11/32, 3/8, 13/32, 7/16, 15/32, and ½ inches. Bit #3 has 9 steps, and the sizes are 1/4, 5/16, 3/8, 7/16, 1/2, 9/16, 5/8, 11/16, and ¾ inches. Neiko 10193A Titanium Step Drill Bit Set High-Speed Steel 3-Piece Set with 28 sizes is ideal for plastic, aluminum, copper, stainless, and metal sheets. VOLTERIN Drill Bits Set with Titanium Coated HSS has 99 individual pieces of drill bits. Having to measure the size of your drill bit is not a problem because every group of bits has their sizes. These sizes are ideal if you want to produce holes accurately. There are also more than one drill bit for each size. This tool provides a wide selection of sizes that you need. They are all labeled inside the case. The sizes range from 1.5mm to 10mm. It is a twist drill bit set which makes smooth drilling. Because the drill bits are made with High-Speed Steel(HSS 4241) and Rockwall Hardness Level HRC60-62, it is very versatile and strong. The titanium coating is so special that the drill bits have the very good surface durability to help penetrate hard materials with ease. This special coating also makes the bits resistant to corrosion and reduces friction between the bits and the material you are working on. Titanium coated drill bits are designed for long drilling life. They could actually last up to 6 times longer than the ordinary high-speed steel bits. Amazing, isn’t it? The uses of this VOLTERIN Drill Bit Set is so wide that it could be useful to any material you are working on. If you are a metal driller, titanium coated HSS is for you. But, it doesn’t work on metals alone. It is the best choice for wood, plastic, steel, and ceramics. HSS is ideal for keeping the performance level at high speed and can be used on ferrous and nonferrous materials. So, the next time you punch a hole, you will get no worries. VOLTERIN Titanium Coated HSS 99 Pieces Drill Bit Set is the best choice for general purpose. DEWALT as a brand can guarantee you with their extraordinarily sturdy and versatile products. 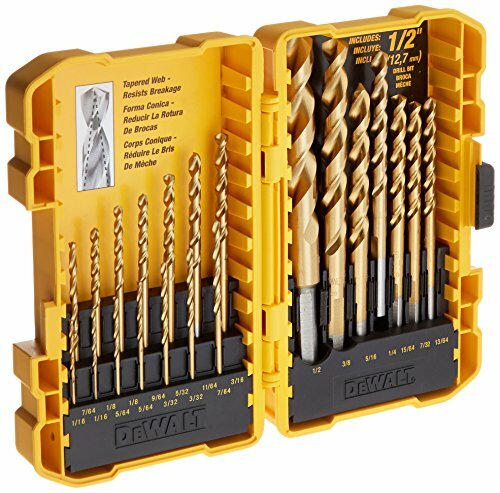 This DEWALT DW1342 21 Piece Titanium Speed Tip Drill Bit Set has various applications. It is ideal for drywall, ferrous metal, non-ferrous metal, lightweight steel, plastic, tile, and wood. The titanium coating provides a longer drill life in non-ferrous or non-iron materials which are commonly used for commercial or residential applications. It can drill through multiple materials in different sizes ranging from 1/16 to ½ inches. Now, you can choose the drill bit size you need easily and fast. Let’s talk about the material. Titanium is an abundant metallic element and very resistant to corrosion. So titanium drill bits are actually a metal formulation of titanium nitride which is used to coat a high-speed steel (HSS) drill bits. The drill bits become incredibly strong and corrosive-resistant. We can say that Titanium drill bits are harder than cobalt drill bits because of titanium coating. On the other hand, they can’t be sharpened very well unlike the cobalt drill bits that are made of cobalt steel. Having titanium coating increases the drill bits toughness and efficiency even when drilling fast. It also increases the drill bits lifespan so you will be able to get more projects for longer periods. If ease is your concern, then you will have no problem with this. 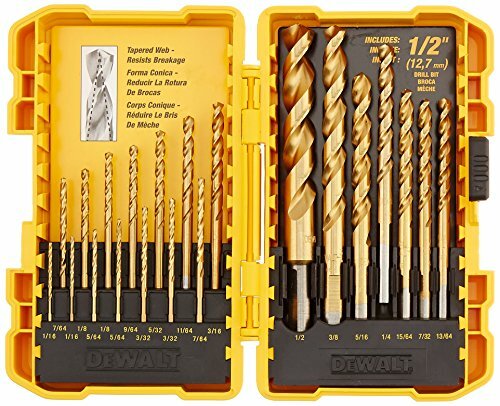 DEWALT DW1342 21 Piece Titanium Speed Tip Drill Bit Set prides its speed tip design which reduces walking and promotes convenience in drilling holes. The no spin or slip shanks keep the bits in place which prevent the bit from slipping in the drill chuck. For storage, it includes an organized container for keeping the bits in place and with listed sizes for easy location. To keep the titanium coating, you can’t sharpen the drills. DEWALT DW1342 21 Piece Titanium Speed Tip Drill Bit Set is a great tool for general purposes. It is essential to be familiar with the uses of these titanium drill bit sets. Another significant thing is your material requirement. When it comes to drilling, there are various materials to tackle on your projects. You might encounter materials such as metal, steel, masonry, wood, plastic, glass, and ceramics and wouldn’t know which titanium drill bit set to use. Well, I’m giving you a quick review of the titanium drill bit sets that you have just read including the materials they are best for. You may want to compare their prices, too. Dewalt set is an ideal tool for drilling metals, hardwood, plastic, and aluminum. The 21 drill bits are also enough for simple jobs with fewer requirements. Its speed tip drill type is specially designed to drill ferrous and non-ferrous metals and reduces walking. The second set made by Neiko is actually designed for metal sheets but it is also used with other materials such as plastic, aluminum, copper, and stainless. Its affordable price is one practical choice. It is very economical for fewer bits but more size choices. So, if you are comfortable using a step drill bit, you could have this as your preference. Volterin has the second highest number of bits among the four sets. These titanium drill bits are ideal for metal, wood, plastic, steel, and ceramics. This is very useful for commercial and residential purposes. So people working for construction businesses may select this drill bit set. The fourth set is made by Vonhaus. It can tackle any project and workpiece you have including iron, steel, brass, copper, and aluminum alloy. It is tested and proven for metal, masonry, plastic, and woodwork. The price is significantly reasonable for 100 pieces of tools. If you are looking for the most complete toolkit that you could use with any material, I recommend Vonhaus drill and driver bit set. It is a comprehensive set for drilling holes and driving bits. The price is also reasonable and you could use the bits for various tasks you would like to. 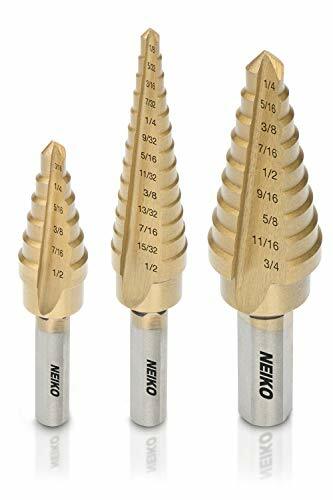 On the other hand, if you are short on budget and don’t have many tasks to do, you can settle for Neiko drill bit set having fewer bits and cheaper in price. As a buyer, always remember to check the product specifications and usage before buying. When it comes to choosing the right drill bit set, you have to know which drill bit set is best for steel, metals, wood, plastic, masonry, etc. Whether you are a pro or an apprentice, having the right tool for your job sets an integral role in your success.